It’s here, hooray, hooray! I love this weather where you don’t need the air conditioner or the furnace and the house temperature hardly changes from morning to evening. 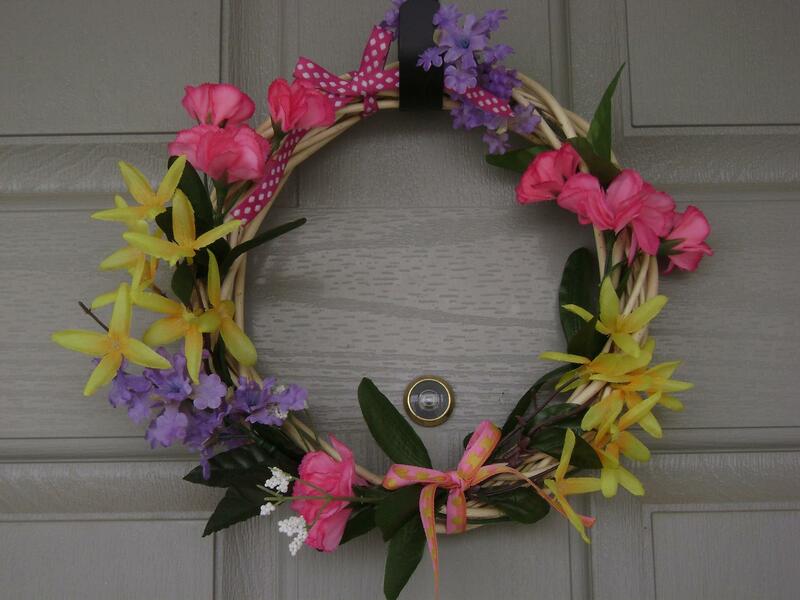 I’m also loving my little spring wreath for the front door. Found the plain wreath and some fake flowers at the dollar store and had to combine them into this pretty. I think it cost me $3, all told? Of course I had to put it up long before spring really got here and it’s snowed two or three times since then, but it has been a lovely little cheerful thing to have up. A perky welcome at the front door! 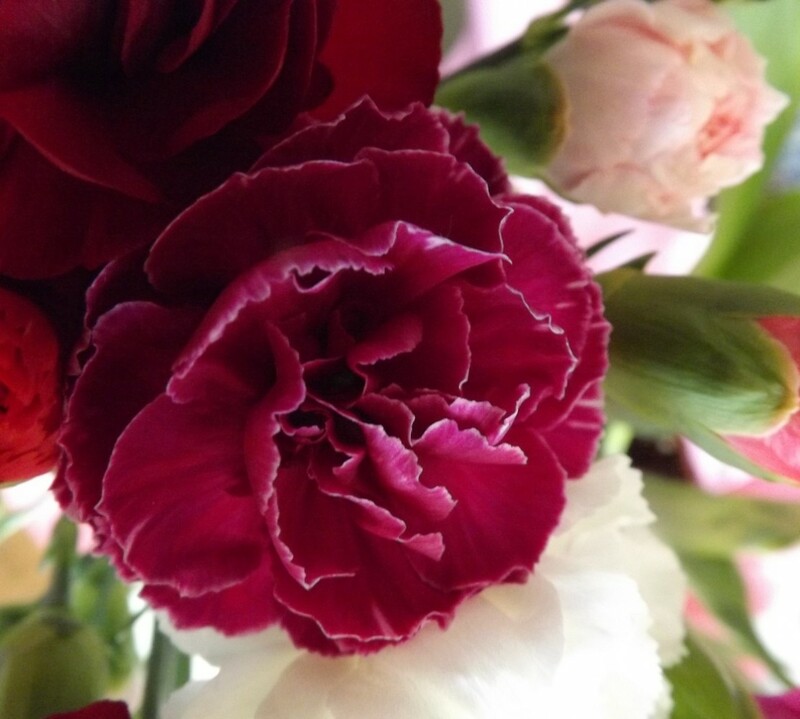 The living flowers that came with the house have also been fun to discover. Two flowering ornamental fruit trees, four rosebushes(three of which seem to have died over the winter, sadly), a good size honeysuckle vine, and two tulips(one yellow, one mystery) and a few little grape hyacinths in the front flower bed. Eventually hoping for lots more flowers but these have been a nice tide-over until we get more figured out. Ben and I have been busy with garden stuff and outdoor projects the last couple days. 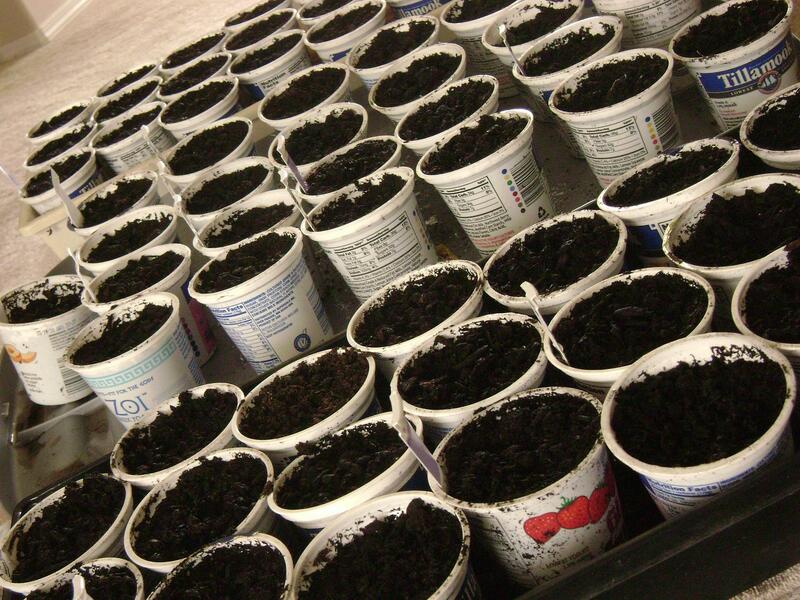 On Saturday we planted three trays of seeds indoors to start growing for our garden this summer! We started tomatoes, peppers, cabbage, cauliflower and herbs inside and the rest will be direct planted outside as soon as the garden beds are completed. It's our little baby garden! I’m absurdly excited about having a garden full of yummy fresh veggies right outside the door. Fresh, healthy, pesticide-free, conveniently located and (figuring the first expenses of building the beds to be reusable) very affordable. I’m hoping that there will be enough yield and that baby will be obliging enough to allow a good bit of canning and freezing, but we’ll see. Obviously he comes first, but this garden was planned with preserving in mind, so if it does well we should be knee deep in produce! After planting seeds on Saturday we peeked outside and discovered that the dandelions were thisclose to all going to seed for the first time, so we grabbed our shovels and trash bags and pretty quickly annihilated two kitchen trash bags full. On Sunday there was a repeat performance with a yield of four kitchen trash bags full. I’m so grateful that my husband doesn’t mind spending some of his free time doing yard work at home after doing it for other people all week! I certainly couldn’t do it myself! Last August, right after we moved in, the yard was very sad and neglected. The weeds had been allowed to grow, unsupervised(bank repo house), all summer so it was a mess of several kinds of weeds ALL about to seed. Three weeks of pulling about 15 black trash bags a week cleaned up the lawn immensely, but we’re obviously still fighting the seeds we couldn’t get to in time. I think if we keep on it we can keep them manageable, but wow, we were really close to behind already this year! Hopefully that’s the worst batch and we can work on it in smaller bits from here on out. At the moment the lawn is almost all green, but in a couple days we should have another crop of yellow blooms pointing the way to the next victims. Spring means a lot of work as far as the yard goes, but it also means a lot of excitement about the potential of what things could look like. We’ll see, at the end of this summer, how well any of our plans play out, but right now it’s very exciting to dream and get the first things started. One last reason Spring is extremely exciting to me this year: I’ve been saying for months now that our baby will be born in the spring!! Hooray! !